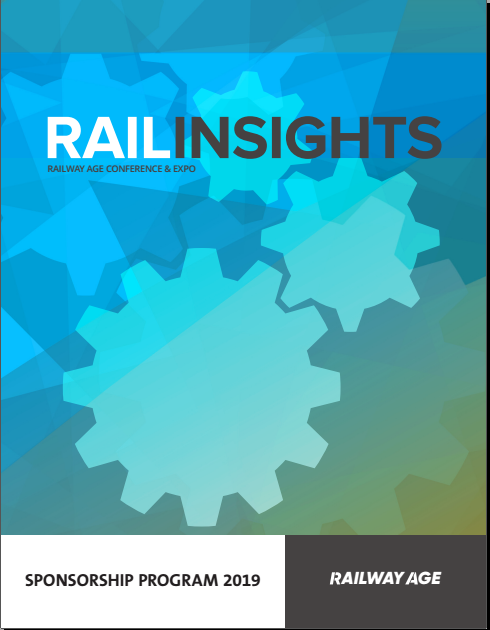 Railway Age’s fifth annual RAIL INSIGHTS takes place June 5 & 6, 2019 in Chicago, IL. Once again, the event will focus on interactive, probing dialogue among top-level industry executives, Railway Age’s experienced, knowledgeable editors, and attendees. Rail Insights offers a unique opportunity to engage, interact, and collaborate on your ideas and insights with the industry’s leadership on key strategic challenges, issues and trends affecting business growth, capital investment, technology, regulation, service quality, and safety in the North American Rail Market. TECHNOLOGY IS EXPANDING, BUT WHERE ARE THE TECHNOLOGISTS? WHAT ARE WE DOING (OR NOT) TO GROW RAIL FREIGHT MARKET SHARE? RAIL INSIGHTS will be held at the Union League Club of Chicago. Our group rate for standard rooms is $219/night (plus taxes, fees) and is also valid two days pre- and post-event. Reservations are based on availability. Peter Gilbertson, President and CEO, Anacostia Rail Holdings Co.
Railway Age’s Fifth Annual Rail Insights Conference is your opportunity to participate in a dialogue with the industry’s leadership on key strategic challenges, issues and trends. We’ll explore what is affecting business growth, capital investment, technology, regulation, service quality and safety in the North American Rail Market, freight and passenger. Explore the available marketing opportunities or contact us directly to discuss options for showcasing your business.